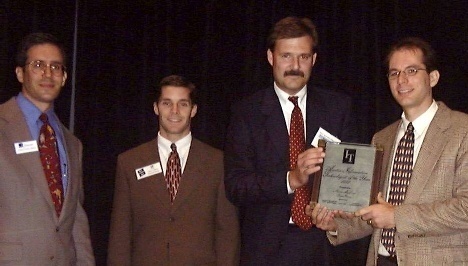 On December 2, 1998, the Austin chapter of the Association of Information Technology Professionals (AITP) presented the first annual Austin IT Executive of the Year Awards in conjunction with the ITEC Expo - the region's largest gathering of IT executives, educators & vendors. 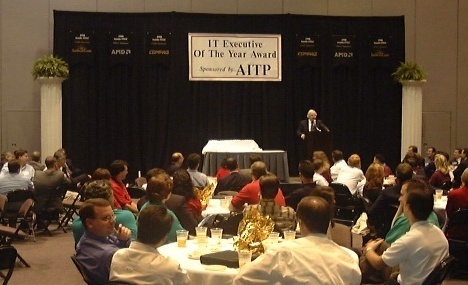 The ITEC/AITP awards ceremony was held at the Austin Convention Center, and it was attended by over two hundred area IT professionals. "This event was the highlight of the year for the growing IT community in Austin," said AITP President Russ Finney. "Our association, and the greater Austin technology community, have been growing in tandem at a rapid rate. This event was our opportunity to momentarily pause, to celebrate our progress, and to recognize several of our city's top IT leaders." 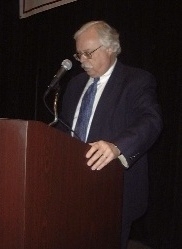 On hand as the evening's featured speaker was Joe Levy, CEO, President, & Publisher of CIO Magazine. 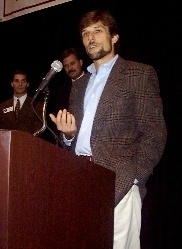 The three sponsors of the event were Austin 360.Com, Compaq Computer Corporation, and Advanced Micro Devices. Two major awards were presented: The Austin IT Executive of the Year, and The Austin Information Technologist of the Year. 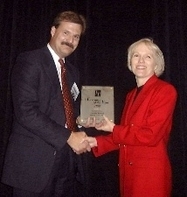 Jerry Gregoire serves as vice president and chief information officer for Dell Computer Corporation. He is responsible for worldwide information systems, including an ongoing program to further develop state-of-the-art information systems and processes. Mr. Gregoire reports to the Office of the CEO. Prior to joining Dell in July 1996, Mr. Gregoire spent 10 years with PepsiCo, Inc., most recently as vice president of information systems for Pepsi-Cola Company, the beverage division of the PepsiCo family. Earlier in his career with PepsiCo, he was vice president of management information systems for PepsiCo Food Systems, supporting the worldwide Kentucky Fried Chicken, Pizza Hut and Taco Bell operations from the headquarters in Dallas, Texas. His previous experience also includes positions as vice president of the systems group for Dean Research Corporation, and as vice-president of information systems for Kraft/CDC Foodservice. Jerry is implementing "Run Dell on Dell" Strategy. Under this plan, the company runs key business processes on its own self developed technology products. He considered by many to be the company's "Chief Technologist", since he is constantly looking for opportunities for new technology use in the factories and in the sales and service areas. In a company that is growing and moving at the rate of Dell, adopting a safe ERP strategy is not an option. Dell will not stand still long enough. Jerry is implementing a strategy which integrates Dell's legacy systems to their new distributed component architecture. It is an evolutionary strategy which will allow Dell to deliver business value in an incremental fashion, as opposed to using a "big bang" approach. When Jerry first joined Dell, the IT organization was very centralized. Jerry has pushed the organization back into the business segments, putting the focus back onto the highest impact business items. This has resulted in better business alignment, and better prioritization for each operation. Jerry is implementing a strategy known at Dell as G2. This G2 strategy relies on using a distributed component model running on client server, using Rapid Development methodology, and the delivery of business changes in incremental pieces. This has greatly increased IT credibility as the IT organization has successfully delivered new systems and important enhancements throughout 1998. The key to this strategy is "invisibility" to the end user throughout the implementation process. Jerry is the leader of the "Customer Experience" initiative at Dell. This is both from a systems and a business perspective. As the CIO, he is uniquely positioned to understand the issues that our faced by many of Dell's corporate customers, and in 1998 he has driven the IT organization to deliver systems which fulfill these "Customer Experience" goals and visions. He is also leading the global effort to develop a customer centered warehouse which will allow Dell to measure and track the quality of these "Customer Experience" initiatives. Jerry has implemented a CIO in each major business area and in each of Dell's regions. He has broken down a highly centralized IT organization and replaced it with a business focused IT strategy with appropriate support from the remaining centralized IT organization. This was huge cultural change for both the IT employees as well as the affected business areas. Jerry was instrumental in making this change a success. Jerry is the champion of Dell's strategy and vision both within IT and within the business. He has the ear and respect of the executive committee. He has rallied the Dell organization around the issue of Y2K. Dell will have solved this problem in 1998. He a is very visible leader both within Dell, and within the greater IT community. Two other honorees at the event were Carolyn Purcell, the executive director of the Texas Department of Information Resources, and Steve Cox, the Chief Information Officer for VTEL Corporation's worldwide IT operations. 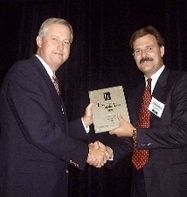 Both were presented awards for being selected as one of the final three nominees for the 1998 IT Executive of the Year Award. Each were commended for their significant contributions in the use of information technology within their respective business organizations. "With over twenty highly qualified nominations submitted for this award, it wasn't easy choosing the finalists," stated Jonathan Hines, AITP Chairman for this year's event, "We are pleased with the amount of careful consideration our selection committee put into the final decisions." Steve Madere, the founder of Deja News, has served as the President, Chief Technology Officer, and Director since its founding in July 1995. From 1993 through 1995, Steve was a systems software consultant for the Kernal Group, a software development firm. Prior to joining the Kernal Group, Steve was a consultant with Ralph Kirkley Associates and worked on the development of text retrieval software and the OS/2 interface for IBM. Steve graduated with honors from the University of Texas at Austin with a BS in Physics and he holds an MS degree in Physics from the University of California at San Diego. Steve Madere is building on his unparalleled text search and retrieval engine, which is capable of accurately searching a 450 GB full-text database within 2-3 seconds. Based upon this unique technology, Deja News is regarded as the leading Usenet search engine, a position the site still holds today. Steve's search algorithms are so powerful that even as 1 GB of new text is added each day to the Deja News archive, users still experience the same excellent performance. In addition, Deja News can now handle text in 16 non-English languages. Steve's technology has driven the success of Deja News as one of the most heavily trafficked sites on the Web. This powerful search capability remains at the heart of what the site has become today, the Web's leading destination for Internet Discussion. Approximately 3.5 million individuals participate in discussion on Deja News each month, generating over 130 million page views. 1998 has been by far the most successful year yet for the three-year-old Deja News. Revenues are up sharply. The Venture Capital community, and established Web-based media companies, have thought enough of Deja News and the company's prospects to have invested more than $20 million in this technology. My Deja News - a personalized Web-based Usenet newsreader allowing individuals to search out and post to various Usenet newsgroups. Deja Communities - a unique service through which small businesses interactive Web presence or enhance an existing Web site. Deja News Discussions - Internet Discussion content packaged based on specific topics, and integrated by third-parties into their existing Web sites. Technology Licensing - this powerful search technology is currently licensed by many of the largest sites on the Web, including: America Online, AT&T WorldNet Service, Bell South, Excite, HotBot, Infoseek, InfoSpace, Lycos, Microsoft's Internet Explorer, The Microsoft Network, Open Text, WebCrawler, Yahoo! and ZDNet. Finally, Steve played a key role in recruiting the business management team charged with marketing and selling this important technology. He currently guides a team of approximately 50 developers.